Synthetic biologist Tal Danino washes his hands constantly, one of the occupational hazards of working with bacteria all day at the Synthetic Biological Systems Lab, which he runs at New York City’s Columbia University. Danino, a TED Fellow, spends most of his time trying to harness bacteria’s unique properties — the same properties that can make them so dangerous for humans – and turn them into powerful cancer fighters. But when he’s not programming bacteria to fight cancer, he’s programming them to make art, in part to make difficult scientific principles more accessible. “It’s nice to use the visual arts to help communicate science,” he says, “and that’s because art really transcends the boundaries of language and also of knowledge.” Danino’s recent creative endeavors include a feminist installation of bacterial cultures taken from the bodies of 100 women (for which he collaborated with conceptual artist Anicka Yi), as well as a series of ceramic dishes inspired by naturally occurring bacterial patterns (a collaboration with artist and photographer Vik Muniz). For his latest project, Microuniverse, he produced a series of dazzling, abstract images created by different species of bacteria, each grown under different conditions for varying lengths of time. “The project is about getting to see this unseen universe that’s really small and all around us, every day,” he says. Here, he describes some of his strangely beautiful projects. Every day, Danino observes the intricate patterns that bacteria form in dozens of petri dishes in his lab. As their cells grow, divide and communicate with each other, they self-organize into colonies to maximize their chances of survival. The patterns they form are determined by both their genetic makeup and their environment. Selecting bacteria that are known to generate certain patterns — for instance, E. coli naturally grows as a fractal, whereas Proteus mirabilis grows as concentric rings — as well as interesting-looking bacteria from soil samples taken in his own backyard, Danino and his team began to experiment with controlling their growth patterns. Ultimately, he hopes that if they could better understand how nature shapes behaviors and patterns in bacteria, it might in turn inspire their work engineering them to fight cancer. By changing the conditions — like the temperature and humidity — under which the bacteria are grown, Danino found he was able to manipulate them into creating certain patterns. For instance, the optimal temperature for growth of many bacteria is 37 degrees Celsius, which is, unsurprisingly, the temperature of the human body. If it’s hotter or colder than 37 degrees, bacteria growth will simply slow. Humidity affects the bacteria in a different way: the drier the environment, the more likely the bacteria are to group together to conserve moisture. Changing the concentration of agar gel — the growth medium for bacteria — on the petri dish also affects patterning, says Danino. The softer the gel, the faster the bacteria spread across a wider area. It’s standard for scientists to use chemical dyes to gather information about a bacteria’s structure. If they want to distinguish Streptococcus pyogenes from E. coli, for instance, they will stain a dish to reveal the shapes of the cells, allowing them to identify them visually. 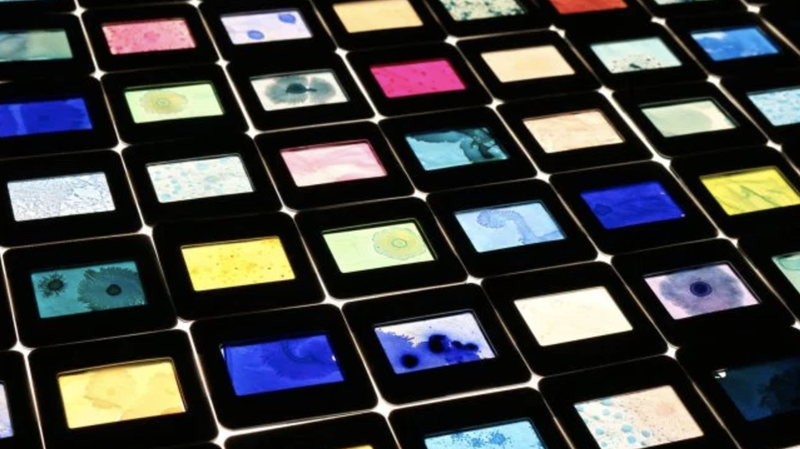 “Scientists mostly look at just single-color images,” Danino says, “so we just played off of that.” In addition to traditional scientific dyes, he also experimented with using food coloring on the agar as well as on the bacteria themselves. He also tried out various color combinations to achieve a gradient effect, as in this image above. “Every framed image or every petri dish is its own little world,” Danino says. “Those patterns look like something that you could see in a snowflake, something that you could see underwater.” With each petri dish, the project aims to represent an abstract universe all its own. “I started seeing these petri dishes, and I was like, whoa, that looks like something you would see in outer space.” Hence, the name Microuniverse. Danino’s art projects are something he does in his spare time. His days are taken up with work in synthetic biology, a relatively nascent scientific field which, broadly defined, involves engineering living organisms to achieve a desired behavior. In his lab, Danino edits and programs bacteria using a process called molecular cloning. After identifying which gene sequences create a certain biological function in a type of bacteria, he and his team can isolate these sequences, amplify them in the lab, and then insert them into the DNA of the bacteria they want to exhibit that function. “Nowadays, you can actually type in that sequence online, and a company will produce that sequence synthetically and send it to you in a tube,” Danino says. Danino hopes projects like Microuniverse will inspire people to learn more about the complex microbial worlds all around — and inside — us and to show them that bacteria can be used for positive purposes, like fighting cancer. “It’s really difficult to teach people about DNA and proteins and molecular cloning,” he says. “But I think when you see an image, regardless of your background, it attracts you to learn more about the science.” What’s next for the project: Danino has partnered with the company Print All Over Me to create custom apparel based on the images of bacteria from Microuniverse (part of the proceeds will go towards cancer research). He also hopes to continue touring Microuniverse, which will be on exhibit at MIT later in 2017. His lab is also working to capture time-lapse videos of the bacteria growth which means, that’s right, E. coli could be coming soon to a theater near you. All images: Soonhee Moon. Author bio: Patrick D’Arcy is the Editorial Manager of the TED Fellows program.